"Devonshire is the real fern-paradise. It abounds in warm, moist and shady nooks; and ferns delight in warmth, moisture, and shade. 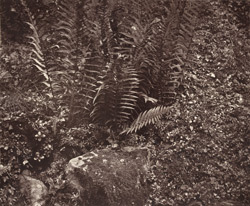 Though they love the warmth, they avoid the sun as much as any maiden rejoicing in a superlatively beautiful complexion, for their delicate fronds also become shrivelled and discoloured in its rays...Amongst the most graceful and beautiful of the many forms of vegetable life are the ferns!" Text by the photographer.